These custom magnets 3 inch circle shaped custom pizza magnets 20 Mil adds punch and perfection than age-old pizza marketing practices. It is well suited for pizzerias and other pizza marketers trying to play long innings from this single investment. 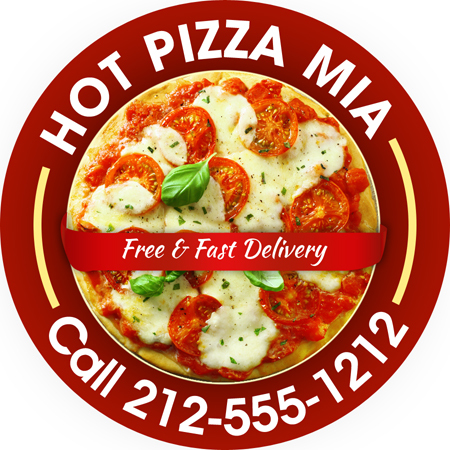 This full color custom magnets can be individually handed out to customers who step into your pizzeria or restaurant at any special time of year or it can be individually mailed to regular customers. We offer appealing price benefits for marketers who work in small budget and wish to bulk gift it for gaining business advantage. Request a quote to know wholesale price discounts offered on these promotional 3 inch diameter circle shape pizza full color custom magnets – 20 MIL.